Create with Gwen: Chalk Marker! Is it chalk? Is it a pen? It's a pen that looks like chalk! 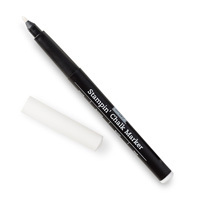 Get the popular chalk-look with this permanent-ink pen. Perfect for writing on black and other dark-colored papers. Single tip. Acid free. I love the Chalk Board Technique using stamps and White Craft ink! Now, with this awesome maker, we can personalize those fabulous cards and scrapbook pages too! Don't look like white ink...truly looks like chalk!